THIS RELEASE IS ONLY AIMED TOWARDS DEVELOPERS! If you're a firmware pirate looking for Cydia or an untethered jailbreak, turn around NOW! For development purposes, AFC2 and SSH access is available. (Don't use this release if you don't know what that means.) 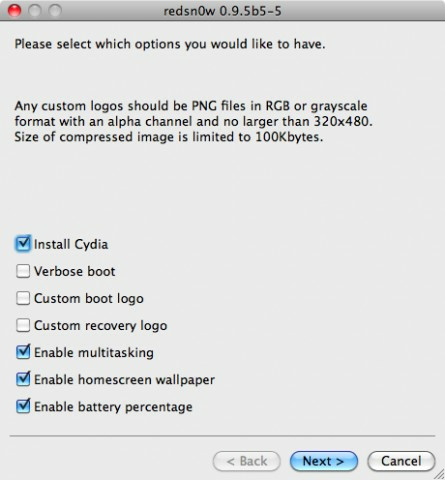 Cydia is not available, because (1) the current releases are incompatible, and (2) end users should not pry into betas. That just winds up causing headaches for developers. 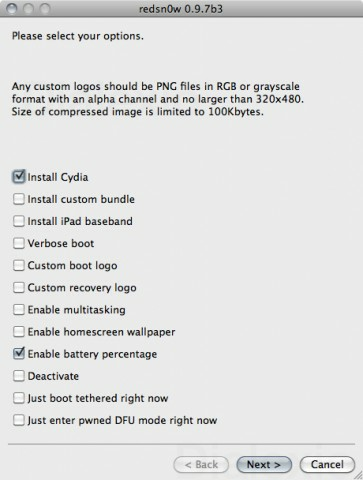 redsn0w is a tool for PC, Mac and Linux that allows you to jailbreak an iPod or iPhone without restoring the device. It differs from PwnageTool because instead of creating a new software file that you install onto your iPod/iPhone, it jailbreaks the system directly on the device. See the change-log for supported devices, and the official website for more information. This version recognizes and jailbreaks iOS 5.0.1 and 5.1.1 on the iPad 2, iPad (3rd generation), and iPhone 4S. 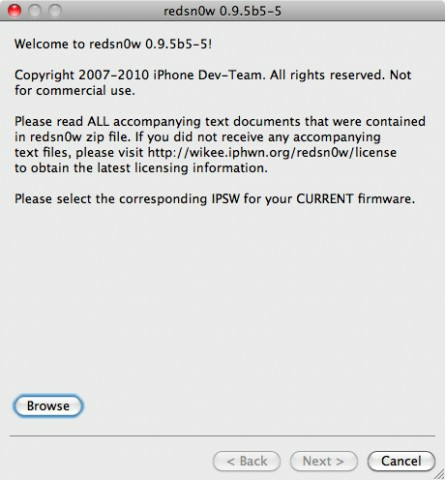 For all other devices, redsn0w supports iOS 3.2.2, 4.1 through 6.0. The jailbreak for iOS 4.2.9, 4.2.10, 4.3.4, 4.3.5, 5.0, 5.1, and 6.0 is tethered unless you have an iPhone 3GS (old bootrom). If you're lucky enough to have an iPad (4th generation) or iPad mini in your hands, you can now use redsn0w to save its 6.0 SHSHs and upload them to Cydia's server. THIS DOES NOT MEAN WE ARE CLOSER TO AN iOS 6.x+A5(X)/A6(X) JAILBREAK. This file has been rated 5 out of 5 based on 2 ratings and 2 user reviews.